This is the first in a 5-part series about how buying a diesel vehicle in 2013 resulted in an electric car and renewable solar panels on our house in 2016. 2013 was a big year for me. Jay and I bought our first home together. I got a new hip. I turned 42, which for Hitchhiker's Guide to the Galaxy fans IS significant). 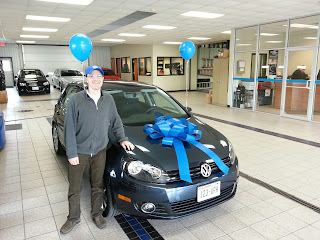 And after a year and a half of research, more than a dozen test drives and lots of talking with people, Jay and I bought a Volkswagen Golf TDI. It's a diesel, EPA 40 mpg and on long trips we get close to 42-43. The big deal about this car is that VW promoted this as a "clean diesel" that got good MPG, very nice performance and clean emissions, something that hadn't been available in a consumer vehicle. 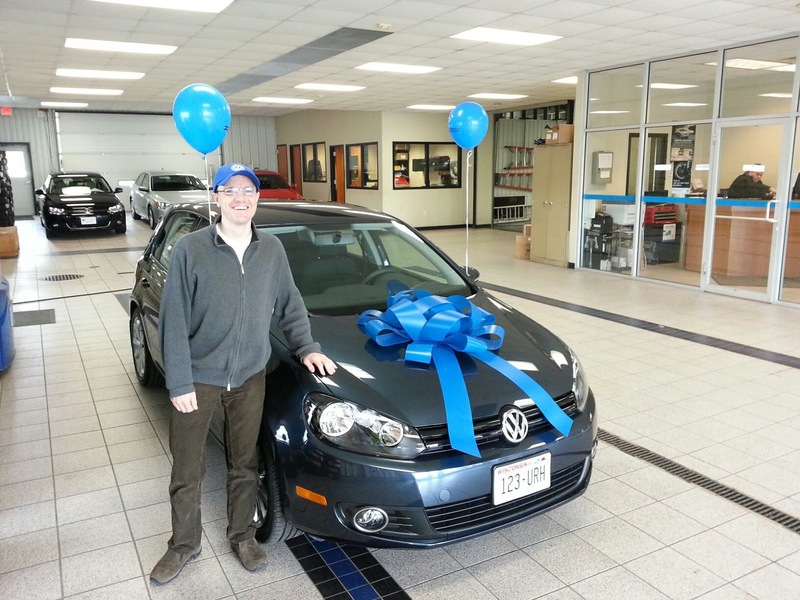 I bought a new 2013 VW Golf TDI thinking I'd keep it for20 years. Now we're figuring out what to replace it with. Then last September the truth came out - VW lied. They had rigged the software in their engines to fib about the emissions when the car was being tested, but then programmed to burn inefficiently when running, releasing 40 times the nitrous oxide than the EPA allows. Not 4 times, not 10 times, 40 times. They said they were sorry. They sent us a $500 Visa gift card for Christmas. And last month, they offered to buy the car back. Since our vehicle is relatively new (a 2013) and only has 40,000 miles, we got a fair buyback offer and we took it. Sometime this November, at the same VW dealership where we bought the car, we'll sell it back to them. They'll send a check to pay off the loan to the bank and give us a check for the difference. And then, we'll have a decision to make. Buy another car? Keep the windfall? We decided to make lemonade, a lot of lemonade, out of this literal lemon. I'll let you know how tasty it is in another blog entry. I bought a new 2013 VW Golf TDI thinking I'd keep it for20 years. Now we're figuring out what to replace it with. Since about Day 2 of having chickens, the idea of a chicken tractor has always intrigued me. Chicken tractor? First, take any notion of 4-wheeled farm machinery out of your head. Replace it instead with a lightweight, rectangular enclosure, covered with netting and a tarp and two wheels on one end that is the daytime playground for a small flock of chickens. 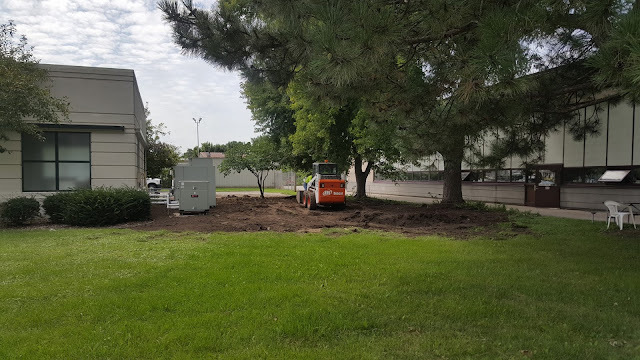 The idea is that the tractor is moved around the yard where the chickens eat grass and bugs, poop a bit and enjoy the outdoors while staying put in the yard and protected from overhead hawk attacks. 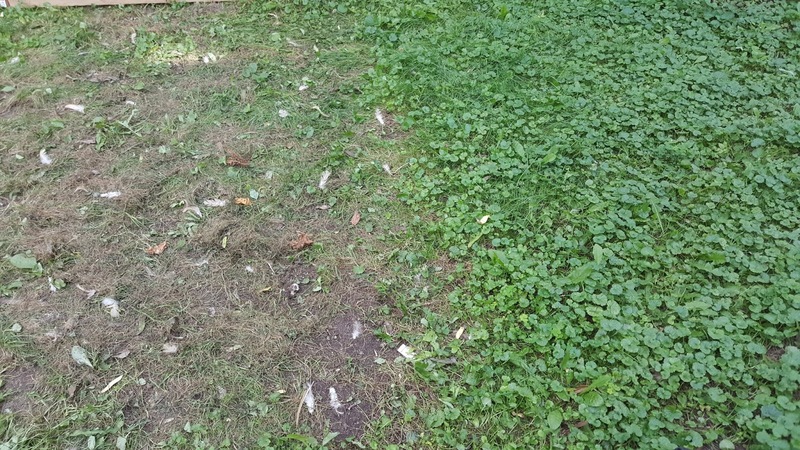 Because the chickens do eat a lot of the vegetation and scratch at the grass, the tractor needs to be moved daily so they don't destroy the lawn. Thus, each day they are fed, fertilize and mow the lawn, are exposed to the sun and have something new and interesting to do each day. Chickens, like any creature, need diversion as well. Our flock of five in their new tractor. By virtue of being lightweight, the tractor is fundamentally NOT ground-predator proof. A racoon, possum, ferret, fox or any other carnivorous predator could easily break into the tractor's light netting to have chicken dinner. But, since these predators are mostly nocturnal, the tractor is safe for the chickens during the day. Daytime predators include hawks, and the netting and tarp prevent raptor attacks. This means that the girls have to be moved (lured, cajoled, chased, treated and sometimes carried) from their safe night quarters (our chicken coop) to the tractor each morning and in the evening, they need to be moved (exhorted, wheedled, tantalize, treated and sometimes carried) back to the coop. As I designed the tractor, I wanted it to have multiple uses. In permaculture terms, this is called stacking functions, where the same object can be used for many purposes (functions). The first function is obvious: the tractor provides an alternate place for the chickens to spend the day, which offers greens and bugs to eat. We have a long, narrow run along the side of our house and in the spring it's rich with weedy vegetation. But it doesn't take them long to mow it down to nothing but dirt, thistles and mint, which they don't seem to care for. The next function is that chickens mow the grass. Literally, we don't have to mow the lawn any more. 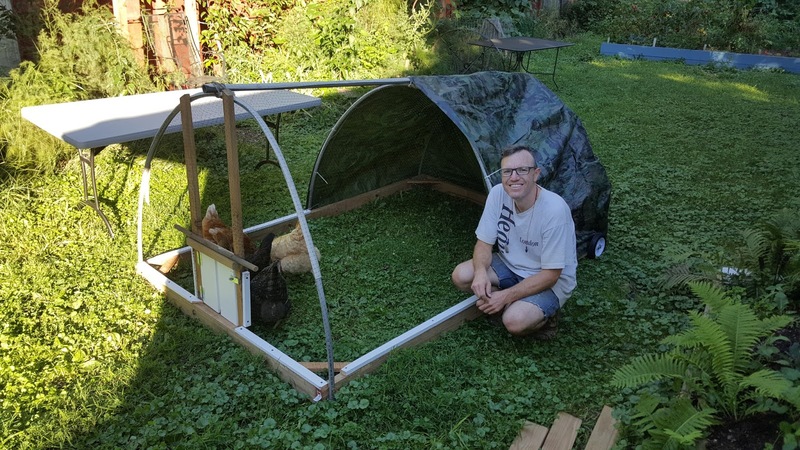 The 5'x8' size is large enough to travel around the entire yard in about two weeks, and small enough that the five chickens clip the grass down in one day. grass seems to bounce back very quickly after a one-day chicken clip. But I wanted even more stacking functions (multiple uses) than lawn mowing and grass food for the chickens. One of the things I've always wanted to do was confine the chickens to our raised garden beds after the harvest, where they would eat fallen fruit and bugs, scratch the soil and deposit their poo exactly where we want it. So I built the chicken tractor to the same dimensions of our garden beds: 5 feet wide and 8 feet long. Our beds are 16 feet long, so this will be easy to set on the bed sides and move from bed to bed, allowing the chickens to do what chickens do best, make a mess while enclosed in their tractor. But there were possibilities for yet more stacking functions. I reused a lot of materials that I had around the house, garage and garden. In fact, all I had to buy were three 2x4 boards (two 8-foot boards and one 10-foot board that I cut in half), and hardware such as hinges, latches and screws. With that, I made the tractor out of hoop house materials I had on hand. 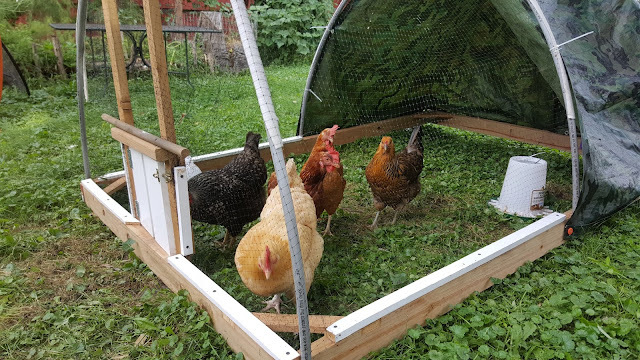 When the chickens move into their coop for the winter, I'll remove the tractor's nest box and shade tarp, throw some plastic over the hoops and plant spinach under it in October or November. Under that hoop house the spinach will germinate and grow, then stall in the winter, and start again very early in the spring. We'll have March and April spinach, well before our CSA will start delivering springtime greens. AND, because I LOVE stacking functions, I won't plant spinach in one corner of the hoop house. In the winter I will start seeds in the basement under grow lights. In March or early April, I move them to a low hoop house next to the house where I keep extra watch on them, and heat as necessary with seedling mats. Once the weather moderates and the plants are heartier, but not ready to be planted, and have outgrown the low hoop house, I'll move them to this larger, taller hoop to harden off and get big before the chickens occupy it again in late spring. When Jay and I moved into our Madison east side neighborhood and I started to build an orchard in our front yard, several people told me about Marge's garden, an illicit, stealth, guerrilla garden on public land, supposedly very near our block. For several years I looked in the general direction that people told me or pointed toward, but I never saw this Brigadoon of a garden. One morning while waiting for the Enterprise car rental office to open (also JUST down the street from our house), I walked behind the building to do a more thorough examination of the area where people told me the house was. You can read more about my discovery. 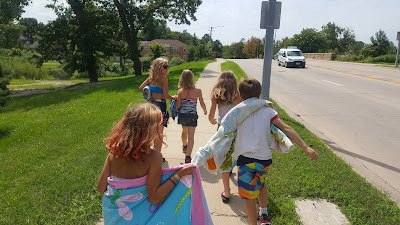 In late August, as my nieces, nephew and I walked to a beach on Lake Monona, I noticed a bulldozer and several City of Madison workers leveling Marge's garden. They knocked down the field of walking onions, flattened the raised beds and picked through the dirt to remove all the figurines, pots, and rotted wood that had once served as Marge's furniture, garden borders, etc. My nieces and nephew were indifferent—they didn’t have any attachment to the place, but I stopped to take a quick snapshot of the project. but I took a moment to reflect on the end of Marge's Garden. I was saddened by the destruction of the garden. It felt like we hadn't given it a proper goodbye. Ideally, some people might have gathered to remember Marge, maybe take one of the pots, or figurines, or a walking onion for their garden, and then let the City workers flatten it. I'm not saying that it didn't need to go. Trees had grown up and mostly shaded the garden, no one was caring for it, and it won't be long before the Public Market District takes its place. In the late 20th Century, Marge started a guerrilla garden here, growing food where there was nothing more than turf. Tucked between the City of Madison Fleet Services building and a wastewater pumping station, for years no one noticed or everyone looked away and no harm was done, but much food was grown. We remember Marge and her many years of illicit and innocent gardening and those inspired by her.